This post is a review of the famous Genesis Framework from StudioPress. 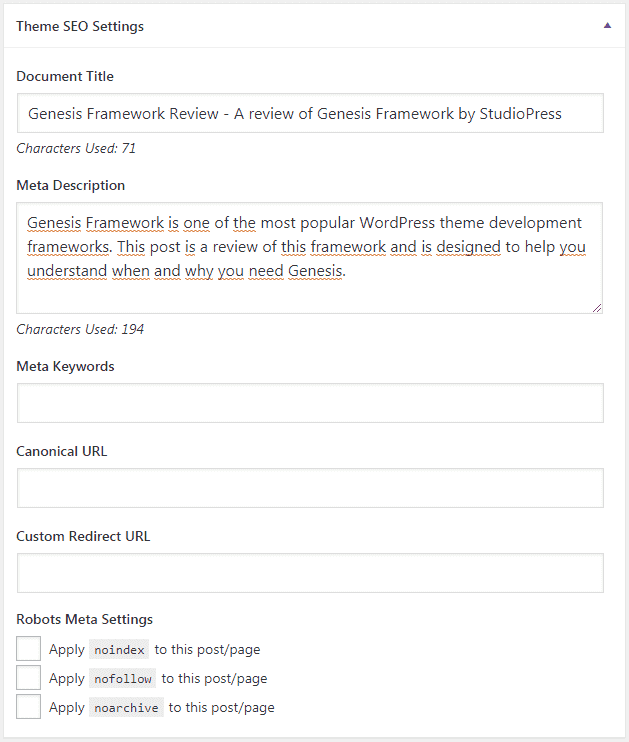 I’ve decided to review Genesis Framework because too many blog owners recommend this theme to their readers, but they do not offer enough details on what Genesis is. Many people end up buying Genesis and only after, they realize that it’s not a regular WordPress theme. This article is designed to help you understand exactly what’s the purpose of this framework and when you need it. What is the role of Genesis WordPress theme? Are there any Genesis child themes? Genesis Framework is a WordPress parent theme and a framework that enable the WordPress theme developers to code their themes in less time, more secure, and respecting the WordPress coding standards. This WordPress theme framework was created by StudioPress. The first version has been released in 2010 and has been updated and improved ever since. At present, Genesis is probably the most popular WordPress theme framework, and it’s used by hundreds of thousands of sites across the world. There are also many famous blogs that use and recommend the Genesis Framework. Among these sites, I have to mention the blog of Matt Cutts, the former head of the web spam team at Google. I’m sure you know Matt Cutts. He is that guy you’ve seen in many YouTube videos that talks about SEO and what Google likes and what doesn’t like. Here’s what we discover if we inspect the stylesheet of Matt’s blog. As you can see, Matt uses Genesis, with a custom Genesis child theme for his blog. I could make a huge list of sites that use Genesis, but that’s not the purpose of this post. Genesis currently costs a one-time fee of $59.95. Once you purchase it, you can use it for an unlimited number of sites. Genesis doesn’t replace the need of having a WordPress installation (the self-hosted version of WordPress). Also, what you need to know is that Genesis is NOT a typical WordPress theme that you only upload, activate and you are ready to go. Let me explain to you in a few words how the WordPress themes work. A WordPress parent theme is the main theme (for example the themes you download from WordPress.org). 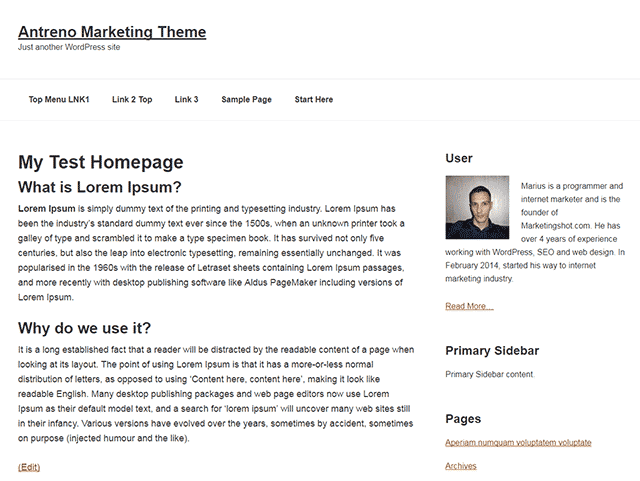 The parent theme usually contains all the styling, theme options, and the theme features. A WordPress child theme is a theme that requires a specific parent theme, and can only be activated when the parent theme is active. The child themes are regularly utilized for editing the parent themes. The child themes can override the styles and functions of the parent theme. All the changes to the parent theme should only be applied using a child theme. Otherwise, if you update your site’s parent theme, all the changes will be lost. Even though we call Genesis a “framework,” at its core, it’s still a parent theme. Unlike the regular WordPress parent themes that can be used standalone, Genesis requires a child theme. Genesis itself has a very minimal visual styling, and it’s only meant to be used along with a child theme. When you activate Genesis without a child theme, it will display a warning at the top of the WP admin pages. And your site will just look like in the screenshot below. Genesis Framework is exactly as its name suggests, a development framework. Its main purpose is to reduce the time a programmer needs to allocate for building a custom WordPress theme. This framework gives your site the base functionality, while the child theme includes the styling and any project-specific features. The purpose of Genesis is not to be a multi-purpose WordPress theme that fits every situation. A common misconception about this framework is that Genesis enables the people with no programming knowledge to build custom themes for their sites. That’s, in fact, one of the reasons why some people purchase Genesis. However, that’s totally false. If you don’t have any coding knowledge, you can’t easily create a child theme for Genesis. To develop a child theme for Genesis, you need to be already familiar with how WordPress works, and you must have a good understanding of how the WordPress actions and filters work. Genesis already includes the required WordPress theme files and a collection of useful functions that a programmer can efficiently utilize in his child theme. The child theme will inherit the HTML structure and framework’s features. StudioPress, the company that has created Genesis Framework, uses Genesis as a base for all their premium WordPress themes. All the themes they sell are child themes for their framework. Every individual child theme sold by StudioPress is priced between $40 and $70. The prices displayed initially on their site also includes the price of Genesis Framework, but you only have to purchase Genesis once and then you can use it for an unlimited number of websites. They also have an offer called Pro Plus All-Theme Package, that includes access to all the themes developed by the company and all the future themes they are going to release. Besides these, there are many other free and premium child themes for the Genesis framework from individual developers. After you buy Genesis, you also gain access to a Sample Child Theme. Despite its name, the sample theme it’s a fully functional child theme for Genesis, and you can use it for your site without any problems. Since I’ve started using WordPress (about 8 years ago), I’ve built several WordPress themes for my personal sites, or for customers. Nabia and Zeno are two of them. I built most of my themes from scratch, but I realized that I was spending too much time doing the same tasks for each project. For example, there are a few template files that have to be included with every WordPress theme for WordPress to be able to detect it as a valid template. Then, there are the files that I had to include for every one of my projects. There are also a few features that I typically add to every theme. The WordPress core already includes some functions, but some essential elements are missing. For example, the post pagination and the breadcrumb navigation. These are all repetitive tasks, and implementing these features for every one of my projects was taking me a significant amount of time. Even though I heard about Genesis some time ago, I haven’t tested it until recently. After my first project built upon Genesis Framework, I can say that I’m already in love with Genesis. The time it took me to build a custom theme for my site has drastically decreased, my site’s HTML code is more semantic, more secure, more SEO friendly, and it includes Schema.org markup by default (a feature inherited from Genesis). The theme of my blog is a custom-made Genesis child theme. By default, Genesis doesn’t include a bunch of useless features, unlike some similar frameworks. It includes just enough features, and more important, the right features. Genesis comes with a built-in options page. There aren’t a lot of choices out-of-the-box, but a developer can easily extend the options panel and add more settings. 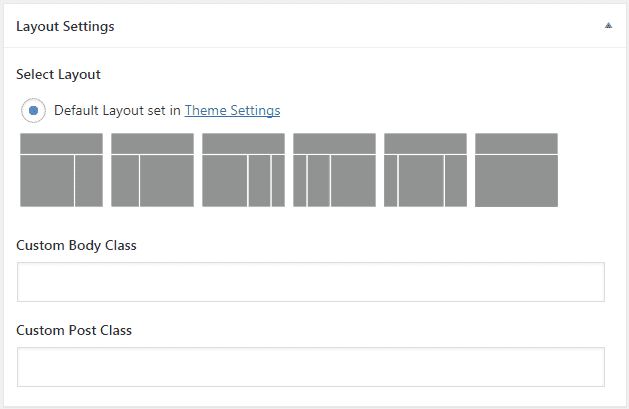 The WordPress theme customizer is similar to the options panel. Unlike the classic theme options page, the customizer enables the admins to modify the site settings and see a preview of those changes in real time. Only the administrator sees these tweaks until he saves the changes. Genesis already adds support for Customizer and a developer can easily add new settings to it. Many of the options you can find under the Genesis settings page are also available in the Customizer. Genesis already registers a few sidebars and has an option that allows the site administrator set the default site layout. BY default, there are six layouts that an administrator can choose from. If you only want to support some of these layouts for your child theme, you can easily disable the ones you don’t need. Besides the default layout, I also like that you can also set the individual layout for every post and page. Under the post/page content editor, you have a panel that allows you to choose a particular layout for that page or use the default layout set from the theme settings. You can also set a custom CSS class for the BODY tag, or post class if you want to give some of your posts or pages a unique look. Having a site that looks good on mobile is crucial in our century. Many people browse the web now from their phones more than from a laptop or a computer. If your site doesn’t look good or takes ages to load on mobile, you will lose a lot of traffic, the search engines will barely display it in the searches, and you’ll lose many potential clients. Genesis itself only includes a minimal style. The child theme will add most of your site’s style, but the fact that Genesis already offers a responsive base will help the child theme developer to continue on this path and build a responsive website that looks nice on every device. Genesis is built using HTML5’s elements like <article>,<header>,<footer>,<section>, and so on. The HTML5 was designed to give more sense to the code of a website. Also, the search engines seem to like it because it helps them to better understand the elements on a page. In addition to HTML5, the Schema.org markup was born. This project is the result of a collaboration between the major search engines in an attempt to develop a code markup that will help their crawlers to understand the content on a site better. Besides being built upon HTML5, Genesis Framework also integrates the Schema.org markup. The search engines use this markup to display content from a page directly in their search results. For example, the star ratings you often see in the results. Genesis is recommended by many for its clean and secure code. Many WordPress sites are hacked every year because they use poor coded themes and plugins. If a theme is not coded correctly, it will leave the attackers a gateway to getting access to your site, stealing your data, deleting your content, and so on. Due to all the development years behind it, Genesis has become one of the most robust and secure WordPress theme frameworks. Of course, the child theme you’ll use along with Genesis must also be properly coded. Over the years, many talented developers have contributed to the improvement of this product, and even though it looks like a simple WordPress theme, it required a lot of work to reach this stage. Because it’s not bloated with useless features, the framework itself loads very fast. If your child theme is also well coded and optimized, your site should likewise have a good loading time. WordPress lacks by default essential options for SEO. Even though we can easily fill these gaps with the help of a SEO plugin, Genesis adds a few additional basic SEO options to WordPress. You can find these options in a section called “Theme SEO Settings” displayed under the WordPress content editor. Using these built-in features, you can define a custom SEO title for your post or page, the meta description, meta keywords (this meta is not used anymore by the search engines), a canonical URL, a custom redirect URL and the meta robots directive. Besides the settings for the individual posts and pages, Genesis also has a list of options concerning SEO under Genesis–>SEO Settings menu. I always like to include a numeric post pagination and a breadcrumbs navigation for my themes. WordPress doesn’t include these by default, but Genesis takes care of that as well. Genesis also includes other useful features. Besides the features that can be seen, there are also other useful PHP functions for developers that can be reused in the child themes. 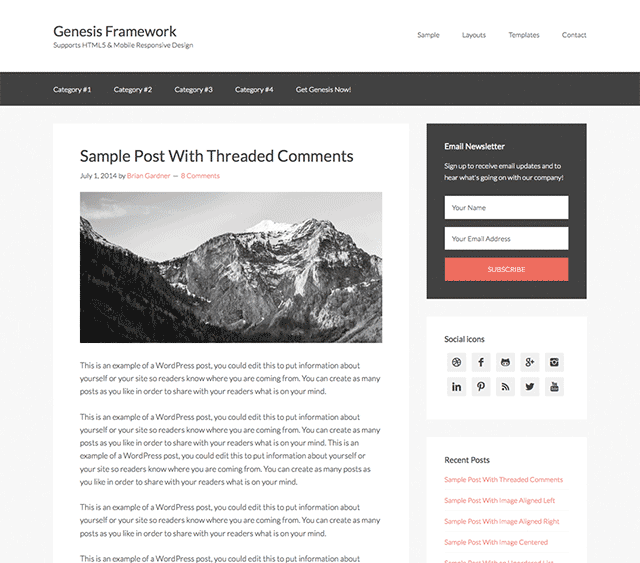 Genesis is an excellent theme development framework that includes the basic functions that every WordPress theme should have. This framework enables the programmers to build WordPress themes in a shorter time, with a better-optimized code, more SEO friendly, more secure, and without having to repeat the same tasks for every one of their projects. Genesis is a fully working WordPress parent theme whose functionality is designed to be easily extended with the help of a child theme. It’s is not a visual page builder (it can, however, work with many such plugins) or a solution that allows the persons without programming knowledge to build custom themes for their WordPress websites. When should I buy Genesis? 1. If you are a web developer that wants to create custom WordPress themes for personal use of for his clients faster. 2. If you want to use a child theme for your WordPress site that has been designed exclusively to work with Genesis. I hope you found my Genesis Framework review helpful and now know exactly what the Genesis Framework is and when you need it.